Jensen Mixers | Side Entry Mixers Made in the U.S.A.
A Belt Driven side-entry Mixer for Sediment Control and Blending Applications. A gear driven side-entry mixer specifically designed for Chemical & High Temperature applications. A gear driven side-entry mixer specifically designed for Petroleum Services. Jensen Mixers has well over 25,000 side-entry mixers in service today. Jensen Mixers have been made in the USA for over 66 years and counting. The design, engineering and manufacture of Jensen Mixers and their parts happens right here in the United States of America. This gives you (the customer) the distinct advantage of having access to the people who’ve designed & built your mixer if and when you have questions, need service or replacement parts. Unlike many of our competitors, Jensen Mixers continues to focus on one product and one product only – side entry tank mixers. In fact, Jensen Mixers is a pioneer in side entry mixer technology. There are well over 25,000 Jensen mixers in service today with many having operated trouble-free for decades. That’s long lasting American quality! A Proven Performer, Jensen Mixers hang directly on your tank’s manway (only). No need for additional equipment such as tie rods and/or a base (unlike our competition). Jensen Mixers’ short shaft design (which is supported both at the front and rear of the shaft) provides for vibration-free service. This ensures a long life to the mixer’s mechanical seal, gearbox, bearings etc. 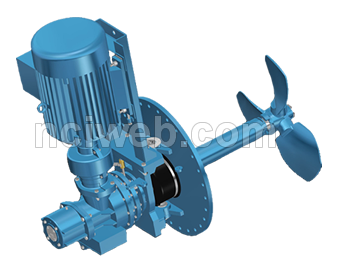 Only Jensen Mixer provides you with a (mixer) propeller custom pitched for your application. Put your trust in Jensen and get unequaled experience, time proven designs that out-perform and out-last our competitors. Jensen Mixers Series 400 Mixers are heavy-duty, belt driven units designed for long life and trouble-free operation. For petroleum services. Maximum horsepower offered is 50. ATEX certified. Jensen Mixers Series 500 Mixers are heavy-duty, gear driven mixers specifically designed for Chemical & High Temperature Services. Maximum horsepower offered is 40. Multiple types of seals are offered. The Jensen Series 500 Mixer is the only side entry mixer designed for use in chemical service requiring 316SS corrosion resistant wetted metal parts. Every design feature is tailored to meet the rugged requirements of chemical plant and pipeline applications. Jensen Mixers Series 600 Mixers are heavy-duty, gear driven mixers specifically designed for Petroleum Services. Maximum horsepower offered is 75. The Jensen Series 600 Mixer is the only side entry mixer designed exclusively for use in petroleum service. Every design feature is tailored to meet the rugged requirements of refinery and pipeline applications. In every horsepower range it offers superior life and load figures, unmatched ease of maintenance and outstanding mixing efficiency. ATEX certified. Jensen Model 401 lease tank mixers offer bearings that are sealed and self-lubricating – this means no lubrication or maintenance for over 250,000 hours. The mixer is driven by a single adjustable V-belt. Northeast Controls offers more than 50 years of tank mixing experience using Jensen’s side entry mixers. We’ve sized side entry mixers for tanks with up to one million barrels (42 million gallons) capacity. Our tank mixing expertise is available to ensure your blending, solids suspension and/or heat transfer requirements are fully met.